The port Mělník is situated on the right bank of the Elbe river from river kilometer 0,7 to 3,0 with the entrance into the port basins. 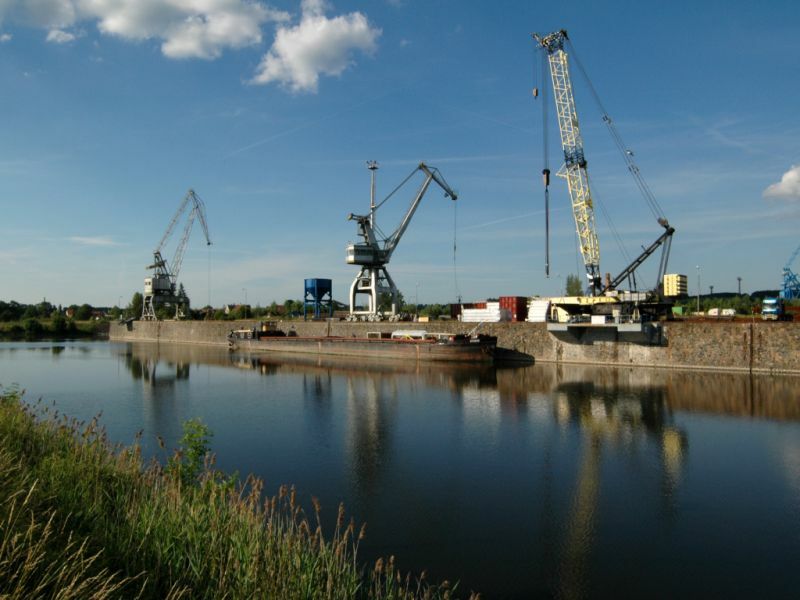 On the lowest grounds situated in the given frame of river kilometers and bounded by the Elbe River and the inundation weir, storage objects, roads, a railway spur, a crane track, handling areas for storage of goods and containers are located. Other higher situated grounds are located on the level of surface Q100. The port Mělník has the status of the public port with year-round, time-unlimited operation time. It also performs protective function for business and personal vessels. It is mainly designated for tranship of goods between water, road and railway transfer. At the same time it serves for state vessels. International logistic centre Mělník is an important crossroad between different modes of transfer. It has its own river port on the junction of the Elbe river and the Vltava river. It has its own tariff railway point, including wide area railway and siding railway network and is connected to Prague road circuit of the highway D8 Prague Dresden with a good access road, so it is in the same time an ideal place for tranship of heavy and over-measurement items and investment wholes with regards to its geographic position as well as with regards to its features and possibilities. There is enough large space for handling and un-loading, the crane with the lifting capacity of 300 tons and tranship dock adapted to loading of heavy and over-measurement items here. 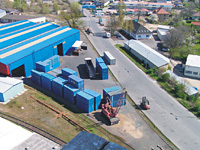 In the port, operational buildings with social facilities, administrative buildings, storage premises, hard handling premises for storage of the containers, a workshop for repairs of techniques, railway and road scales, two gatehouses, handling area for heavy items with the crane MKZ 3000 with lift capacity of 300 tons, crane tracks with port portal cranes, the container crane FAMAK with lift capacity of 40 tons, the petrol station Bencalor. By implication, however, also other kinds of goods are transhipped here. For instance all kinds of agrarian products, building materials and other mass substance in bulk. Furthermore, it concerns shipments in packets, iron, chemical products as well as containers and so on. Most of the hard areas are leased to the company Maersk Czech Republic, Ltd., for handling and storage of containers. Another hard area is leased to the company M+L Logistik for parking of cargo sets. The rest comprises of handling and transport areas. In the time of usual operation, capacity of the port is 17 positions for state vessels with capacity of 41 vessels. In the moment of passage of high water and ice drifts, capacity of the port is 87 vessels. The vessels can draw water and electricity in the port. In 2009 was completed and put into operation project "Expansion of intermodal transport terminal" in port Mělník. The vessels of foreign shipping are regularly going into the sea ports of North Sea, Baltic Sea and Wand ports in Germany, the Netherlands and Belgium. It is possible to transport the goods Into the ports of Switzerland and France, and by using channel Rhine-Mohan-Danube in the direction to the Danubian ports in Germany, Austria, Slovakia and Hungary. These are ports situated on all European water routes. Abroad and from abroad, mass substances, heavy and over-measurement items, Investment wholes and individual packages are carried. Furthermore, the foreign shipping carry out carriages of KASK vessels, floating elements and machinery and ships in the cargo premise also by dragging behind the vessel. It is implied, that a big part of carriages, heavy items and investment wholes constitute, which arise from the fact that the biggest part on carriages of these goods the port Mělník has with the possibility of tranship and storage of these items, and with a long tradition and furthermore also by virtue of the checked and ensured routes of these over-measurement items from around the Czech Republic into the port České přístavy, j.s.c. Mělník. These carriages are usually directed further into the states of Benelux. M three vessels have the installed system of satellite monitoring of the traffic through GPS and transfer of data through GSM. Furthermore, it is fitted with the measurement facility of PHM consumption, which enables to minimize costs of PHM, the share of which In total costs Is one of the highest. Also these data are transferred through GSM to be further processed. On the boat Apollo a rudder facility was installed which ensures safety of the navigation and carriage of goods. For the future, transfer of push boat of type TR 610 with push barge TČ 1 100 and TČ 500 also in the foreign relations. In 2011 occured at the vessels of foreign shipping to exchange a substantial part of the shell plating, all with the financial participation of the European Regional Development Fund under the Operational Programme Transport. 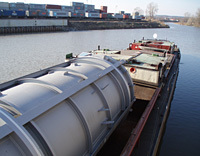 In 2011 were ensured at the push barge TC 1068 lightweight covers of the cargo space that significantly extends the possibility to use the vessel for the transport of various materials. Vessel becomes eligible to transport material that due to weather conditions succumbs to destruction. Lightweight covers were purchased for the financial participation of the European Regional Development Fund under the Operational Programme Transport. The company České přístavy, j.c.s. carries on own inland flotilla of river vessels comprising of big cargo push vessels with tonnage of 1000 tons in the number of 9 vessels, small cargo push vessels with tonnage of 500 tons in number of 5 vessels. Furthermore, there are push boats of type TR 610 (1 boat), TR 400/500 (9 boats), adjusted low-draughter TR 801 (1 boat) and one port TL (1 boat). We dispose of floating cranes for tranship of vessels in inland relations regarding transported substances, as are gravel sand, stones and excavated material. The intent is to buy a band excavator by which the scope of services offered by us will be extended and required transport and tranship capacity in inland relations and projects will be Increased. The device for measurement of PHM consumption and satellite monitoring of the position of the vessel through GPS have been already Installed on the most vessels. All data are transferred on-line through GPS for the next processing. Installations are also prepared for other vessels. 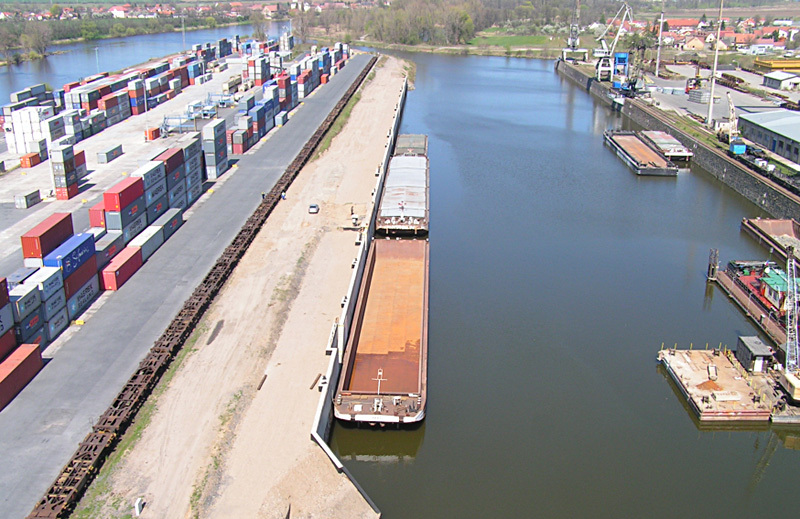 carriage of floating facilities and vessels, both own and other interested persons with regards to carriages on all navigable inland water routes of the Elbe river and the Vltava river. On the ships lift in Holešovice, under-draught repair works of the parts of ship's body, changes and repairs of propellers and jets, of vessels are progressively performed, as well as controls of under-draught parts by Czech Shipping and Industrial Register (Český lodnf a průmyslový registr), State Navigation Administration (Státní plavební správa), etc. Furthermore, coating and maintenance of under-draught parts of the body. 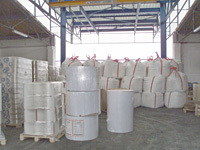 Section of storage logistic Mělník deals particularly with storage different kinds of commodities, including dangerous goods. However, an exception is not storage of difficult handled goods and over-measurements goods. Storage No. 1 - storage area with the wire-concrete floor with acreage of 2 840 m². The storage is fitted from both sides with a loading ramp and adjacent tracks, which enables loading and un-loading from the trucks as well as railway cars. It is accessible from one side also for vessels from the river basin and a it is possible to un-load plece goods directly from vessels into the storage. Inside the stock, a bridge crane with tonnage of 10 tons is situated which overhangs from both sides above the adjacent tracks. The storage is also adjusted for loading of bulk goods from big bag into the road or railway tankers. It is used especially for storage of different kinds of piece goods and machinery facilities. Storage No. 9 - storage area with the wire-concrete floor with acreage of 1 350 m². The storage is fitted with a loading ramp for loading and un-loading from trucks and containers. 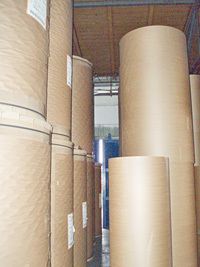 It Is mainly used for storage of piece goods of different commodities. Storage Maglička - storage area with tarmac floor with acreage of 3 280 m². The storage Is divided into three storage parts which are fitted with bridge cranes wit a particular tonnage of 5 tons. The storage is also rideable for road and railway vehicles, the loading and un-loading of which can be carried out directly inside the storage. It is suitable for storage especially of products of steel industry, as is for instance steel profiles, table sheet metal in the scroll, pipes and machinery facilities. It is also used for handling and storage of structures, heavy items, granite, marble etc. We also dispose of some smaller storage for piece goods with acreage of 300 - 500 m². Concrete storage area with acreage of approx. 20 000 m² is available for storage of heavy and over-measurement shipments. In connection to storage of the goods mentioned above, we carry out a scale of services associated with It. It particularly concerns loading and un-loading of the goods from and into all means of transport, inciuding their fixation, signing, issuing of shipment documents etc. By implication, customs services of any kind (clearing into free circulation, transit regime, storage in the customs storage, and so on), storage evidence, stock-taking of goods, issuing of documentation to incoming and outgoing shipments, photo-documentation and reports on damages by the pertinent damaged parties or defective shipments, putting into palettes and foliation of goods and other services according to the needs and wishes of customers are performed. Besides services which were mentioned above, we ensure all kinds of carriage (road, railway, sea, river and multimodal). Container storage and carriage, including associated services (parking, repairs, maintenance, complex customs dispatch of service from customs storage). 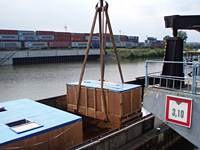 The significant part of our work is transhipping of goods from/into all kinds of 20' and 40' containers. These tranships can be divided into two basic groups. The first case concerns loading/unloading of goods which are stocked in our storages, the other case concerns the goods which are transported to us only for purpose of loading/unloading into the containers. We deal not only with normal palette goods but also with the shipments to be handled in a difficult manner. The integral part of these activities is ensuring of the fit fixation and ensuring of goods against damage during the following transport. I.e. ensuring of fixation material which corresponds to nature and character of goods, in case of necessity, we also ensure special treatment with the wood relating to heat (fumigation) and issuing of Phytosanitary certificate with that connected. In the port Mělník, also a container terminal with total acreage of approx. 80 000 m² has been established. This terminal serves daily for incoming and out-going direct container trains with destination to West-European ports Rotterdam, Bremerhaven, Hamburg and to the east and south of Europe with destination of Bratislava, Budapest and Koper. Besides these main foreign transport flows, also some domestic relations are processed. The prospect is to extent it up to final acreage of approx. 220 000 m². Technical-administrative facilities are also prepared for workers of the terminals and waiting and parking areas are available for drivers ensuring collection and delivery of containers.